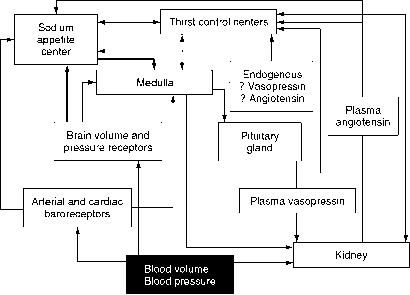 Figure 3 Schematic representation of the main factors proposed in osmotically induced regulation of the sensation of thirst and their interaction with the control of diuresis. A rise in plasma osmolality will tend to stimulate greater excitatory activity, whereas a decrease in osmolality will activate more inhibitory inputs. Neural pathways are indicated by thick arrows and hormonal input by thin arrows. 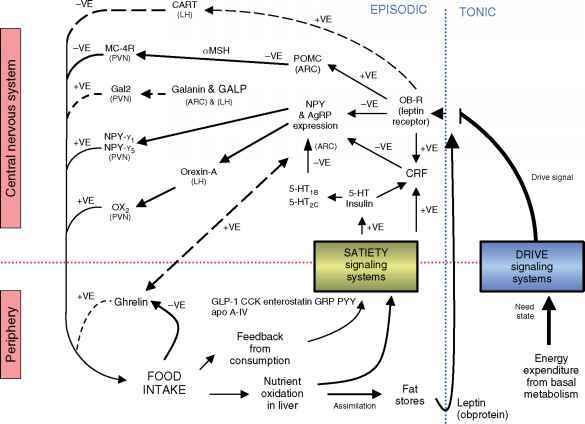 Figure 4 Schematic representation of the main factors proposed in volemic-induced regulation of the sensation of thirst and their interaction with the control of diuresis and sodium appetite. A fall in circulating blood volume will decrease baroreceptor activity, which will increase excitatory activity, whereas a rise in volume will have the opposite effect. Reduction in blood pressure will decrease renal perfusion, which will activate the renal renin-angiotensin system. Neural pathways are indicated by thick arrows and hormonal input by thin arrows. 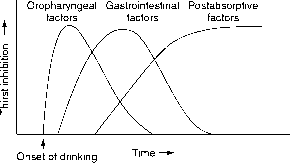 of responses, including the mechanochemical composition of the food before absorption, the neuroendocrine response to digestion, the movement of water into the intestine during digestion, and the osmotic solute load that occurs following absorption. 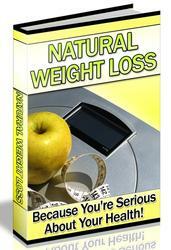 The intake of minerals is essential to replace those lost from the body and for growth. The majority of mineral intake is supplied by the food ingested, and indications of a desire or appetite for ingesting specific minerals have been shown in animals and man. Although sodium appetite has been linked to the sensation of thirst, anatomically and functionally the controlling mechanisms are distinct and separate.